Check out our Facebook page and click "Like!" Lebanon Square Circlers have been dancing since 1949 and is the second oldest square dance club in Oregon. The club started after the American Legion Auxiliary sponsored dance lessons, and has been running continuously ever since. Located in Lebanon, Oregon, heart of the Willamette Valley, the club insignia is the strawberry. 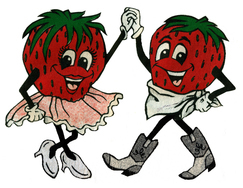 Celebrating the Lebanon Strawberry Festival every year, the club joins in the festivities by participating in the Strawberry parade and sponsoring dances and activities during the first full weekend in June. Dances are held every first and third Saturday night (September—June) at the Odd Fellows Hall, 20 East Ash Street, with Pre-Rounds starting at 7:30pm, Mainstream at 8:00pm and Plus at 10:15pm. The club welcomes couples, singles and family groups. Lessons begin every September and the club welcomes any interested individuals. For more information contact 541-401-9780.